TEN years ago the idea of Hyundai producing Australia's best-selling sports car would seem laughable. Yet sales figures for 2015 show the quirky Veloster has achieved this lofty sporting top spot thanks to a blend of bold yet polarising styling, decent ride and performance, value for money and reassuring warranty. 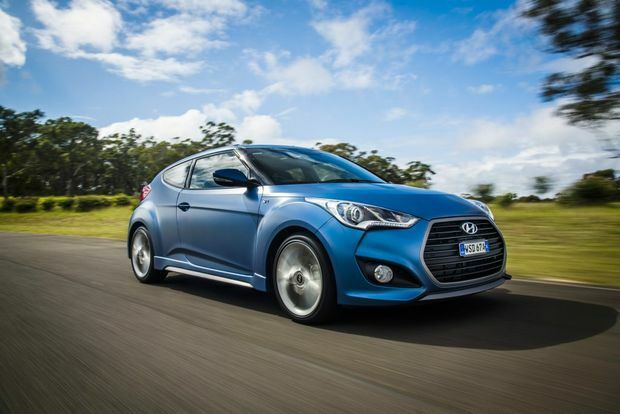 Now three years after its Aussie debut, Veloster Series II has received a mid-life makeover. A new optional seven-speed double-clutch transmission for SR Turbo models arrives, there are refinements to the locally tuned ride, handling and steering, while there are style tweaks for the cabin and body. There are four Series II Velosters to choose from with the same naturally-aspirated and turbo 1.6-litre GDi engine line-up as before: Veloster and Veloster + are the 103kW style statements, while the ones you want - the SR and SR+ Turbos - offer a far more sporting 150kW and 265Nm on tap. We sampled the SR Turbo models, which Hyundai is pitching at 10 bucks under $30,000 - a drop of $3000 - price matching Toyota's bargain sports rival 86; the current next-best seller in the sub-$80k class. 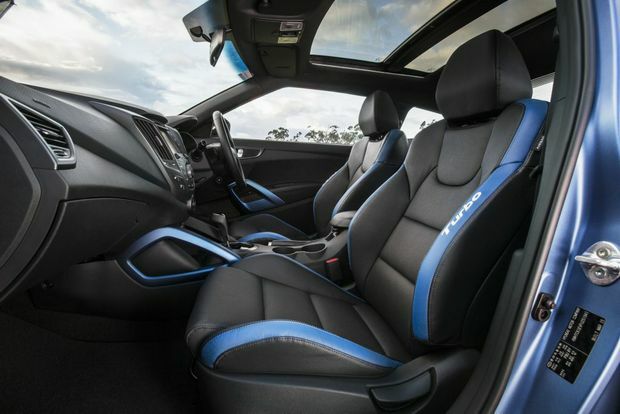 The Veloster's cabin has never been awash with fancy 'I'm a sports car' accoutrements, but the SR Turbos now welcome coloured stitching for the steering wheel, coloured seatbelts and sporty electroluminescent instrument cluster. Opt for the Blue Sprinter matte exterior paint - to my eyes the best choice from the colour palette - and you get blue highlights for the leather cabin trim, while those splashing out on the SR+ cars enjoy heated and ventilated front seats. Front pews are supportive enough for any sporty driving shenanigans, and comfy too. The rears feature decent enough leg room, although the coupe shape of the Veloster does restrict rear headroom somewhat and you sit directly beneath the rear glass. 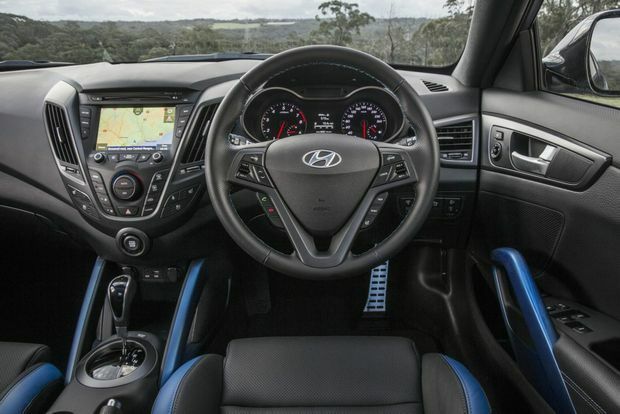 General cabin feel is typically Hyundai, that is plain rather than premium but well-laid out with simple to navigate controls. Those holding out for a truly hot Veloster like the one-off 190kW Veloster Raptor shown last year are to be kept waiting. As it stands the SR Turbos remain flagships, and while the 150kW boosted motors are more rewarding than the NA Velosters, the car's competent chassis is begging for more oomph. For the Series II we have more of Hyundai's Australian-focused ride, handling and suspension fine-tuning, with revised spring rates and damper rebound stops, shorter front stabiliser bar and slightly fatter tyres over new 18-inch alloys. On road and closed test track the Veloster proved an easy and predictable thing to pilot, with crisp steering turn-in and nice balance and grip. The NSW-based team creating the bespoke setup for these Hyundais seem to have aced the compromise once more, with only the harshest of road surfaces proving jarring through the suspension. The six-speed manual is the pick for driving thrills with a light clutch and easy gear shifts at high revs, but a pedal setup that makes heel-toe changes a stretch for those practicing the art. The new seven-speed DCT will be the best-seller, but is better suited to daily road life rather than the track where it feels compelled to shift up a gear at times despite the driver's paddle shift inputs. 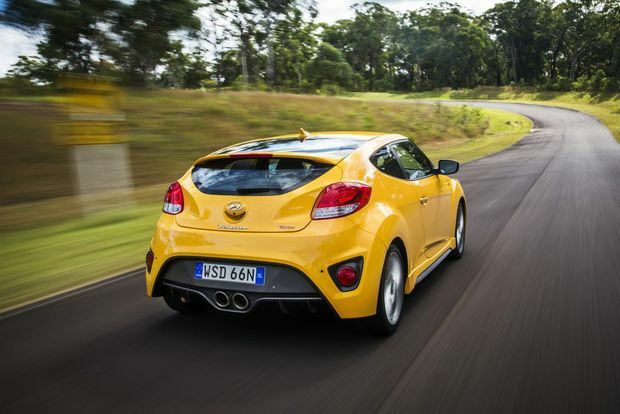 Veloster Series II is a playful and rewarding sporting drive if not a particularly fast and thrilling one, but if more power and aural excitement were offered in the future it could really become a hero car. While the sub-$30k price of the entry-level SR Turbo appeals, owners have been robbed of sat nav, auto climate control, electric mirrors and electric glass sunroof from the Series I model. Spend the extra $4000 for the SR+ and you keep such niceties, and gain the heated and ventilated seats. The SR comes with 18cm touchscreen with integrated rear view camera, rear park assist, electric driver's seat and 18-inch alloys. Hop in the SR+ and you get all those previous extras, plus the driver-adjustable three-mode Flex Steer system. As a coupe-hatch, otherwise known as a kammback, you get one door on the driver's side and two on the passenger's. Not only is this a funky talking point it is obviously useful for rear occupants to get in and out, rather than enduring the typical coupe clamber. And for a sports car that isn't quite a hatchback, boot space is surprisingly decent. The seven-speed dual-clutch automatic sees an average consumption figure down from 7.6 litres/100km in the outgoing six-speed auto to 7.1 litres here. The manual still proves the more frugal at 6.9 litres. Due to the high performance nature of the turbo cars, service intervals are a short six months or every 7500km. Beyond the Veloster-signature asymmetrical door configuration, there have been subtle exterior changes to the Series II. A new grille, bonnet, body kit and twin-spoke 18-inch alloys set it apart from the outgoing model, and a revised colour palette sees Sunflower yellow and that excellent matte blue added. Sports cars sales quickly lose steam if not for enticing refreshes, so these are timely upgrades for the segment-leading Veloster to try to maintain top spot. Suspension changes have re-focused the already sharp Series I Veloster, while a sub-$30k price for the SR Turbo puts the fight to Toyota's 86. The car remains an enjoyable and rather sensible sports car choice practical enough to use everyday, but surely now is the time for a proper hot version to really give Hyundai true sporting kudos.